For the 4th consecutive year, Radio Harrow were present at the annual Wheelbarrow Race in Pinner. The day, which featured on 22nd April 2018, was held as part of the annual St. George’s Day celebrations. With the sun shining across North West London, the day featured campanologists, a great 50’s and 60’s performance from Simply Grey, and the infamous wheelbarrow race. Costume-clad wheelbarrow custodians raced each other down the High Street. Getting underway at midday, the first part of the day featured live music from Simply Gray, as well as the annual renewal of the vows for the local Scouts and Guides. Ahead of the famous Wheelbarrow Race at 3pm, there was a parade of the competing teams, with all contestants and their wheelbarrows walking down the high street. The race itself was broadcast live on Radio Harrow, with various commentary teams situated across the race track. Radio Harrow’s David Reece was at the finish line keeping listeners and members of the spectating public informed as the competing teams completed the race. The winning team were Carbos, and the team with the best costume, were ‘The Things’, who received their awards from the Mayor of Harrow, and boxing superstar, Elliot Matthews respectively. You can listen back to our live commentary of the day on Radio Harrow’s Listen Again. We’ll be adding more photos to this page over the next few days! John S, Hansa V, Shrey P, Malcolm C, Mike L, and Atul R.
Led and run entirely by volunteers, Radio Harrow are always on the lookout for new volunteers. 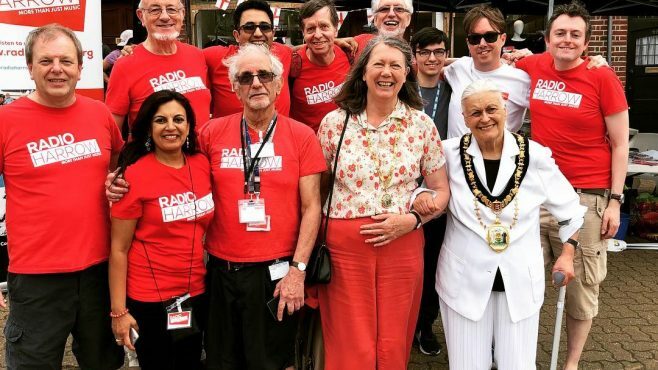 Whether the broadcasting side of a radio station appeals to you, or if you want to contribute to the patient befriending services that the charity provides, you can find out more here.